Here’s another snippet from “Temple of Chaos”, the short story I have in the upcoming SWORD AND SORCERESS 30. 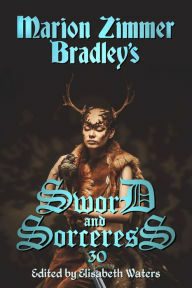 The Marion Zimmer Bradley Literary Trust says, “Sword and Sorceress 30 is available for pre-order in Kindle and Nook formats. It will be released on November 2nd. There will be a trade paperback edition, but unfortunately that can’t be pre-ordered. So go reserve your e-copies now, eh? The bandits were, of course, waiting for them. The outlaws were dressed in mismatched pieces of stolen armor and stolen finery. Jewels glittered from the tangles of matted beards and greasy hair. A man whose swagger marked him as the band’s leader faced Pimchan, his visage pinched with frustration. The man bellowed something his followers apparently understood, for they shouted in response and charged the town’s defenders. Pimchan ran to meet the chief’s charge. She would have been surprised, had she not been focused on protecting her own head, to see the vigor with which barbers and bakers met the bandits’ onslaught. The outlaw chief was a better fighter than she expected though not, fortunately, as good as he thought. Parang in one hand, kris in the other, he swept toward her like a walking windmill. Left. Right. Left. Right. The fool! It was like fighting a puppet. As if her opponent moved in a slower time, Pimchan dodged, blocked, and deflected his predictable blows, her blue-steel saber ringing against his lesser blades. Had he never fought anyone who fought back? Probably no one who spent the day training, no one whose life was weaponry and fightcraft. As he fought, his lips moved. Cursing? A waste of breath. A blow she should have met and repelled slipped through her guard and drew across her shoulder. It found a flaw in her armor – a near-impossible fluke – and blood ran down her arm. She didn’t feel the pain yet, but the gleam in the bandit’s eye chilled her. Not ordinary cursing. Magical cursing. And the man had some power. A WRITING PROMPT FOR YOU: An opponent has more power than the main character expects. This entry was posted in Sample Sunday. Tagged short story excerpt, sorceress, strong female character, sword and sorcery. Can’t wait to read the rest. Christmas is coming. Just sayin’. I was just did it once, and the remember-er kept resupplying the line, and I DIDN”T LOOK!